Choix idéal pour les amoureux de la nature! Un tour magnifique, avec un guide exceptionnel ! 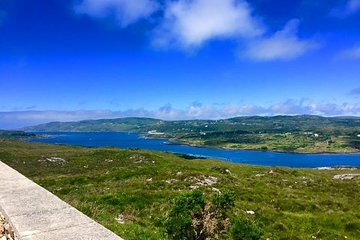 Je recommande vivement ce tour qui nous fait découvrir de nombreuses facettes du Connemara ! Pour notre part, nous avons choisi le parc national du Connemara, l'arrêt était suffisant pour manger, regarder le film de renseignement disponible en plusieurs langues et effectuer la deuxième randonnée sur trois, qui offre une sublime vue sur le Connemara ! While disappointed that the Abby was closed to the public on the day we went, the rest of the excursion was excellent. Mike is an excellent driver and skillful tour guide. We were delighted with the pace, the comfort, and the delightful commentary. So glad we chose this tour. Absolutely wonderful! Our driver/guide, Mike, was so knowledgeable and welcoming. There were only 4 of us on the coach so he could really go into detail. He could not have been nicer - funny too! Despite not normally being a fan of coach trips, I cannot recommend this highly enough. The scenery was stunning in Connemara and the trip to Kylemore Abbey was wonderful. We had numerous stops and photo opportunities along the way. The driver Damian was very knowledgeable, entertaining and gave us an interesting commentary throughout the day. Would highly recommend - very good value for money. We had Shamus as our driver and guide and he was AWESOME! !so nice and informative and would stop when we wanted to snap a couple extra pictures. We only had about 15 people on this tour and it was great. Would definitely go again with Shamus...Shout out to Shamus..you were awesome. it was beautiful. the guide was well informed. Only thing keeping the trip from 5 stars was the waiting time after we were picked up at out BnB. It was a perfect tour, thank you to the bus driver ! It was a perfect tour ! Thank you to the bus driver ! Most of us visited Connemara National Park while a few of us went to Kylemore Abbey. We were given the opportunity to hike up to the summit of Diamond Hill. Not a very steep climb nor muddy but wet in some places. For those who went to Connemara, they did have the opportunity to see Kylemore Abbey for a photo stop. I have done Kylemore Abbey before but never the national park. It is the perfect excursion if you don't want to rush and have a day in the nature. There are several stops in fisher villages and interesting places with very nice views. After this you can spend a couple of hours in Connemara National Park which is enough for a nice walk up to the peak. The guide guy was very quiet and gave us nice advises and good history review.